Click on the images to view at a larger size. Viking Glory. Here is a historical item in several senses of the word. 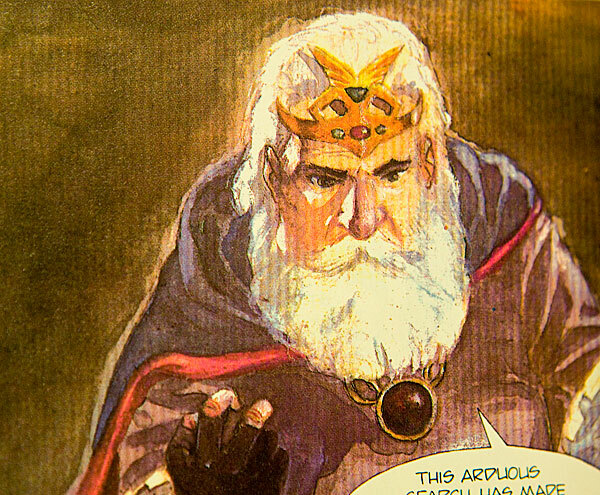 We have a story that takes place in the time of Viking warriors – at the very start of our DC Universe reading timeline – chronicling the early adventures of Jon the Viking Prince, who was at one time the most popular character in DC’s long running Brave And The Bold title. We also have a book that was produced early in the age of graphic novels and collected editions. As such, the artifact seems to be crafted with a care not given to every comic book released today – but is it worth that care? Or has this volume been out of print for so long for good reason? 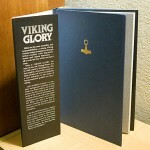 The book itself is finely crafted. My copy is a standard sized hardcover (though it’s available in softcover as well), and I’m proud to have it as the first on my DC bookshelf. 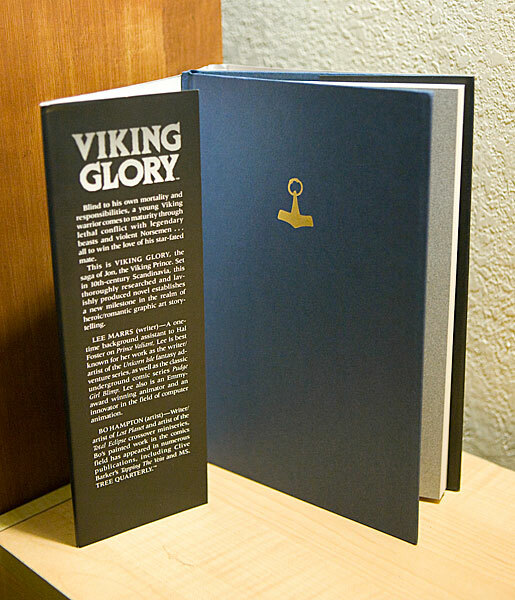 I couldn’t help noticing the granite textured endpapers or the gold leaf Mjöllnir on the cover under the dust jacket. 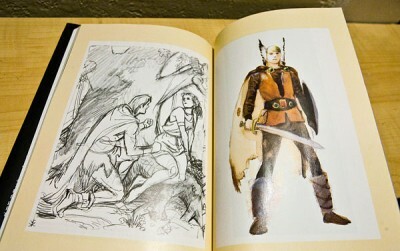 The interior is similarly eye catching, with painted illustration by Bo Hampton. The back includes an 8 page sketchbook with a couple pencil illustrations and some character studies, which I always enjoy seeing. There are also sketches featured on the title pages for each chapter. Then there is a couple page introduction by Will Eisner in the front, intriguing when it is technical (“careful panellizing used in service of the internal action” ) and boring when he insists on introducing the cast, something usually best left to the comic. He may have deemed these introductions necessary for a reason, however. The story, by Lee Marrs (who I’m not as familiar with), is at times hard to follow. 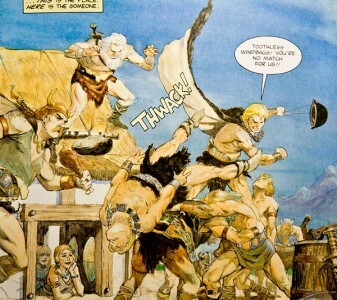 While obviously meticulously researched both in terms of DC continuity and Viking lore, it may be hard to get into for someone with no acquaintance with Norse society or legend. If you give it a few pages though, it becomes a fairly easy to recognize plotline – a quest for the marriage (and love) of a lady. By a young and brash prince, no less! It may not get points for originality, but it’s interesting to see the youth of a rough and tumble character like the Viking Prince, who next shows up significantly more grown and in entirely different situations. It was an enjoyable read, but I only felt moved by the story a couple times, which about matches the amount of times I had to flip around to understand exactly what was going on. Let’s call it average. Not painful to read, by any means, but not a classic. It’s possible that telling a story is harder with painted illustration – things like character motion and expression tend to be easier to understand when illustration is simplified. Honestly though, a large factor in my enjoyment was the art. If the dialogue wasn’t earth-shattering, it was sometimes accompanied by absolutely wonderful facial expressions. Sure, there are plenty of awkward panels which, again, seems unavoidable in a project made up of this many painted pieces. One particularly cumbersome love scene is worth sharing with you. The moments that fall flat are far outweighed by the really stunning work in the book. My favorite scenes are the light and colorful ones – at Jon’s Viking village home surrounded by green hills, or a quiet scene with Jon and Asa near a sunny window. The more romantic art is simply stunning. A minor complaint is that a couple panels seem to have been reproduced badly, with over-saturated colors and some kind of banding (see picture, bottom right). When I first picked up this book, just flipping through and looking at the art was a lot of fun. It started well, but after reading I was a little let down. A lackluster ending, which didn’t properly tie back into the romantic crux of the story didn’t help. But flipping back through the book again, I couldn’t help stopping to enjoy some of the panels I had neglected to settle on during my rush to finish. I realized that the book would be something I would go back to more for the illustration, as if it was a coffee table art book, than for the plot. Good, but not excellent. 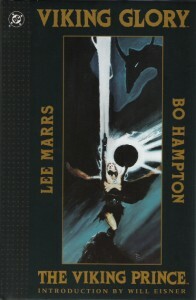 The introduction by Will Eisner and high quality binding may have raised my expectations unfairly, but I do think the volume is worth purchasing for Bo Hampton‘s art alone. Especially since you can easily find it for under 10 dollars, often under five! Not if you’re only interested in the Super Hero side of DC, but Jon shows up in a couple surprising places. If you want to get a glimpse of the history of the DC Universe, it’s fun to know that it was always a strange place. Because it all takes place in historical context, I’ve placed this book very early on our Reading Order. It’s fine to read on its own! Once it comes out, though, you may like to read the hardcover collection of the Joe Kubert Viking Prince stories, published well before this graphic novel. That book contains all of his early appearances. We next see a Viking Prince in the Legends Of The Dark Knight collection Batman: Other Realms. Or you’d want to pick up that aforementioned Kubert volume. Well I’ll be darned…this is a series and character I have never, ever heard of, and for that you certainly have my attention! Wow. 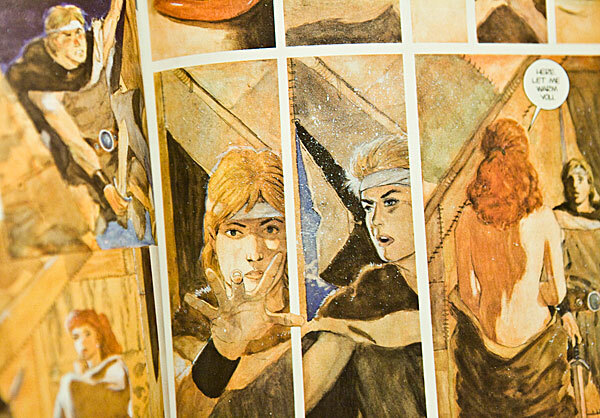 The art in this looks beautiful, almost like something by Jon J. Muth. And for such an early collected edition, it seems incredibly well designed and put together. Even if the story is average, I’m going to find a copy and give it a read simply because I’m so intrigued by it now. 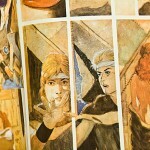 I’d also be interested to find the Kubert material. Next you’re going to tell me you haven’t read all of Shining Knight! Kidding. Yeah one of the reasons I decided to review this one (besides the fact that it comes early in the timeline and I hadn’t read it yet myself!) 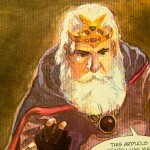 is because the Viking Prince volume of Kubert’s work is finally about to come out. I’m really excited about it, because, like you said – he’s a very under promoted character. His latest appearance is in the 2008-2009 War That Time Forgot mini, but for the most part he’s very scarce. I hope I didn’t sound too negative about the story in the review. Just because of the presentation I really got my hopes up, and it turned out to be kind of standard. It really was enjoyable, though, I never was thoroughly frustrated or annoyed with it. Yeah, that’s what I gathered about the story…I don’t think you were too harsh. I’m just imagining it’s probably exactly what you would expect from it if Will Eisner weren’t telling you it was amazing. I didn’t realize that Kubert hardcover was coming out either, but I just looked it up on Amazon and it seems interesting. And at almost 300 pages, that’s a nice, meaty collection. Well.. 4 percent, haha. I’ve made amazon some nice money so far though! I’m trying to get ebay referral links on here too, so users can shop around. If it goes well enough I’ll be able to move to a private server eventually and the site won’t be so damn slow, lol. here Review: Viking Glory: The Viking Prince | Trade Reading Order. Is it just me or does it look like a few of these comments come across like they are left by brain dead visitors? urls of your community sites like your linkedin profile, Facebook page or twitter feed?